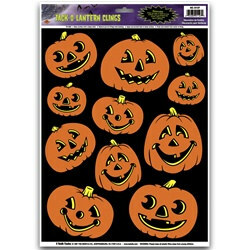 Spook your trick-or-treaters this year by adding some scary Halloween window clings to your home! Get in the Christmas spirit by adding snowflakes, lights, and ornaments to your windows. Even put a little love in the air by decorating with our Valentine's Day window clings! We carry window clings for almost every holiday, season, and theme! Check out our gel clings for something a little different! They hold the same principal as the window clings, just peel from the sheet and place on your windows or mirrors where they'll look the best! No matter what kind of cheap window clings you're looking for we've got you covered right here at PartyCheap.com! Cheap window clings are a great way to decorate a home, school, or office quickly and cheaply. PartyCheap.com has a large selection for almost every holiday. Window clings compliment other decorations you may already be using and they still allow light to shine through your windows. Static cling window decals are the fast and easy way to decorate a classroom. Clings can be applied to almost any smooth and clean surface. Traditionally window clings are used on windows and mirrors. Some of our customers use window clings on "White Boards" and filing cabinets. Check out our extensive collection of cheap clings for St. Patrick's day, Valentines Day, and Easter. We also have cheap window clings for the fall seasons like Halloween, Thanksgiving, and we even have Christmas Clings! Holiday decals are a great way to decorate for a holiday at the last minute. Clings doesn't have to be limited to the home, office or school. Window clings can be used in cars, inside lockers, on picture frames or any smooth surface. Remember, window clings are reusable, so you can transfer them to many different places and use them year after year.